DESCRIPTION JUST REDUCED!! 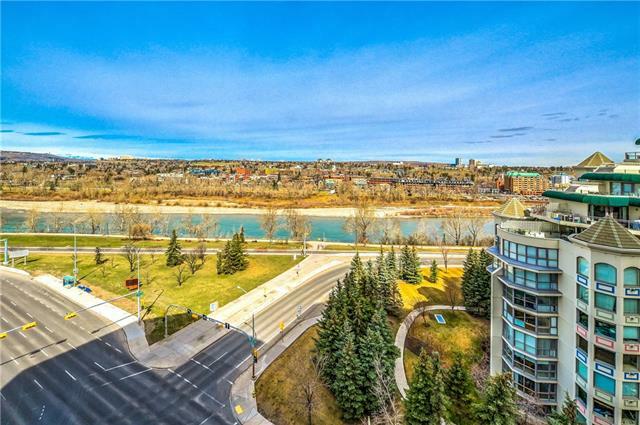 FLOOR TO CEILING WINDOWS AND MODERN WIDE PLANK FLOORING greet you as you enter this open concept condo featuring 2 BALCONIES, 2 HEATED SECURED PARKING STALLS, AND 2 BEDROOMS PLUS A DEN. The large kitchen is loaded with cabinetry and FITTED WITH THICK GRANITE COUNTERTOPS including an island over looking the dining room, living room, and RIVER and CITY VIEWS making it perfect for entertaining. The huge LIVING ROOM IS FILLED WITH LIGHT FROM WEST and allows for access through the double glass doors to the den…as well balcony access for those evening BBQs. THE MASTER BEDROOM ENJOYS 2 CLOSETS & PRIVATE ENSUITE, & the 2nd bedroom also has its own balcony. Insuite laundry with washer/dryer, assigned storage locker, plus ACCESS TO SOME OF THE BEST AMENITIES INCLUDING POOL, HOT TUB, MEETING ROOMS, FITNESS CENTRE, AND 24 SECURITY...all in a great building walking distance to trendy Kensington and LRT lines. Call today to book your private viewing. Home for sale at #601 1088 6 AV Sw Calgary, Alberts T2P 5N3. Description: The home at #601 1088 6 AV Sw Calgary, Alberta T2P 5N3 with the MLS® Number C4224955 is currently listed at $484,900.